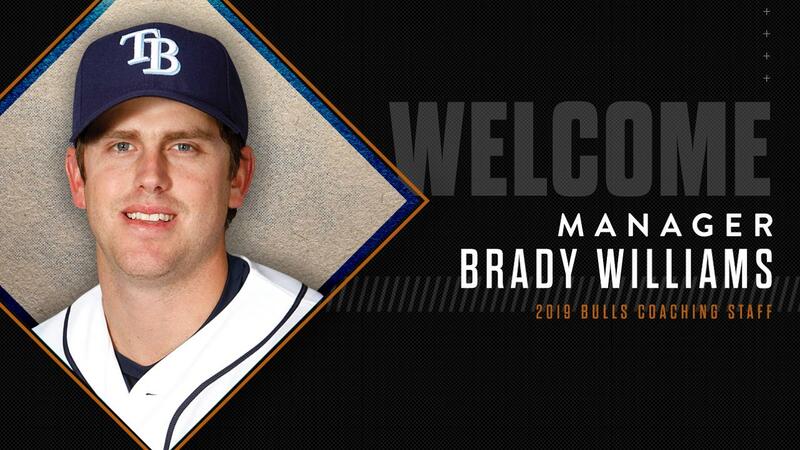 The Durham Bulls, in conjunction with the Tampa Bay Rays, have announced Brady Williams as the new manager of the Bulls. Williams takes over for Jared Sandberg, who was hired as a Major League Field Coordinator by the Seattle Mariners in November. Joining Williams on the Bulls coaching staff is Pitching Coach Rick Knapp, Bench Coach Dan DeMent and Third Base Coach Quinton McCracken. Williams, the son of former Major League manager Jimy Williams, joins the Bulls after spending the last five seasons as manager of the Rays' Double-A affiliate Montgomery Biscuits. The 39-year-old led the Biscuits to the playoffs each of the past four seasons, including a 79-win 2018 campaign, which was the franchise's highest since 2007. Prior to his time in Montgomery, Williams managed the previous five seasons with stops in Advanced-A Charlotte (2013), Single-A Bowling Green (2010-2012) and Short-Season Hudson Valley (2009). Over his 10-year managerial career, Williams has compiled a record of 776-699 (.526). Before joining the managerial ranks he coached in Advanced-A Vero Beach (2008), Single-A Columbus (2007) and Single-A Southwest Michigan (2006). Williams has spent his entire managing and coaching career in the Rays system. "This is a new challenge for me and my family, and we're excited about facing this challenge," Williams said. "I learned a lot in my five years in Montgomery, but I'm looking forward to working with the next level of player in Durham." The fifth manager in Durham's Triple-A history, Williams was selected by the Boston Red Sox in the 45th round of the 1999 June Draft. The infielder played five seasons of Minor League Baseball in the Boston (1999-2001), Minnesota (2002) and Tampa Bay (2003) systems before joining the coaching ranks. "We can't wait to have Brady put on the Durham Bulls uniform," Capitol Broadcasting Company VP - Baseball Operations Mike Birling said. "He's been a great asset to the Tampa Bay system over the past decade, and we're excited to introduce him to our fans as he aims to bring the DBAP and the City of Durham yet another championship." McCracken returns to Durham after appearing in 85 games for the Bulls during the 2000 season when he batted .260 and swiped 13 bases. Prior to his professional career the former outfielder played collegiately at Duke University, and was taken in the 25th round of the 1992 draft by the expansion Colorado Rockies. He joins the Rays organization after spending 2018 as a minor league coordinator for the Miami Marlins. Previously, he spent five seasons in the front office of the Houston Astros, and two seasons before that in the front office of the Arizona Diamondbacks. The 48-year-old played parts of 12 seasons in the MLB (1995-2006), and was the Tampa Bay Devil Rays Team MVP in the inaugural 1998 season. Knapp returns to Durham for a second straight season after leading the Bulls pitching staff to the third-best ERA (3.54) in the International League in 2018. The team's staff led the league in strikeouts (1,267) and WHIP (1.23) and surrendered the second-fewest walks (380) in the regular season, before posting a 3.42 ERA in the postseason en route to the team's second straight Governors' Cup title. DeMent is also back in Durham for a second straight season after serving as Bench Coach for the sixth Bulls team to capture the league title. Returning to Durham for a sixth season is the team's Strength and Conditioning Coach Bryan King, and back for a second season is the team's Athletic Trainer Scott Thurston.